I note that Sport Today is coming from the second (Football Focus) set at the moment. I believe this is due to some revamping taking place of the normal studio which is currently being upgraded. It has been tweaked a few times already but I personally already like the current look of the main studio. I wonder what improvements they are making? Anyone? As per the News Channel thread, they were training presenters to use a new touchscreen on set. A shame it isn't being tweaked to become the permanent home of Breakfast in the morning. Mediaboy's tweet made me think they were installing the desk that was used during Rio. It had the capability of being raised and lowered for Breakfast. Here's an image that was originally posted here by JK08. After Rio they never took the desk out, they continued to use it. 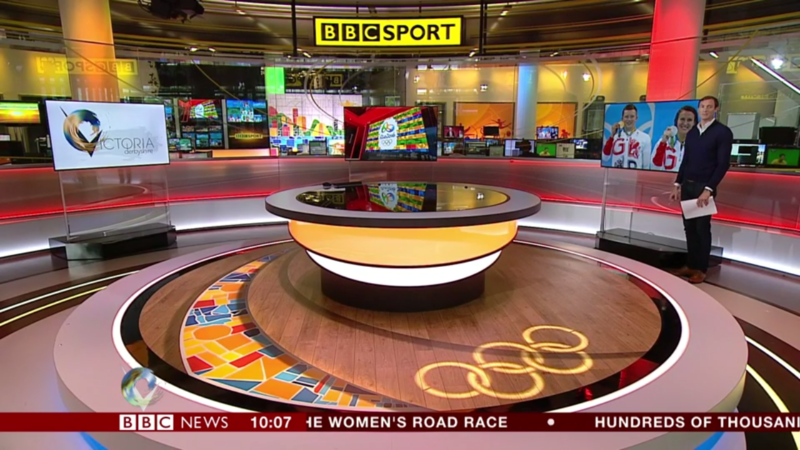 Had a peek at the new look Sportsday earlier ... coming to BBC News and BBC World News soon. Looks and sounds great!